Erik Lindman (b. 1985, New York) received his B.A. from Columbia University in 2007. Recent solo exhibitions include Metal Paintings, Almine Rech Gallery, London (2016); Open Hands, Almine Rech Gallery, Brussels (2014); Do not touch doubtful things, ribordy contemporary, Geneva (2013); and Human Personality, Almine Rech Gallery, Paris (2012). Lindman lives and works in New York. Tell us a little bit about yourself and what you do. I was born in New York City, where I continue to live and work. I often use surfaces I come across to create paintings. What materials do you use in your work and what is your process like? The surfaces I pick up on the street have a specificity to their shape. I use these surfaces as flat planes and tend to level their dimensionality by bringing the edge of the found surface into a continuous level with the surface of the canvas. The surfaces are adhered and screwed into canvas-wrapped panels. 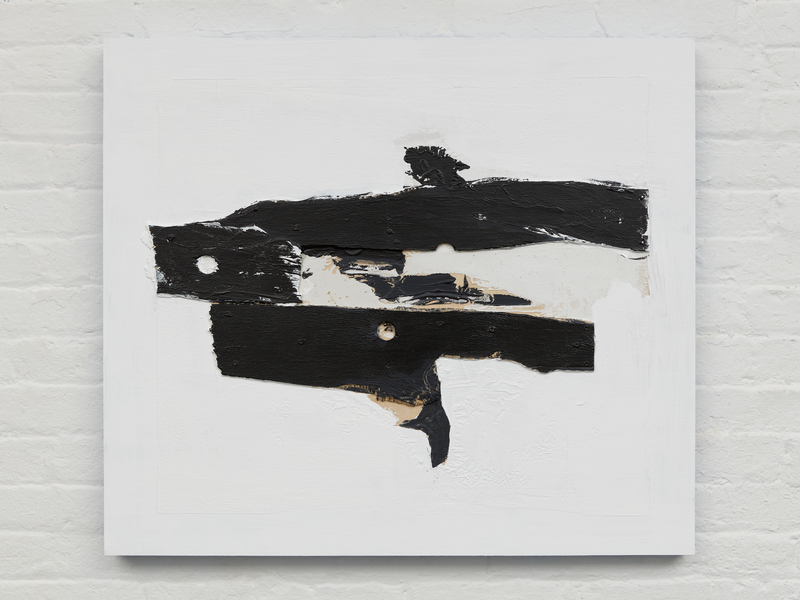 Cropping, awareness of the scale and the negative space around the found element make up much of my work. This way of seeing translates to my drawing practice and other paintings that I make with more traditional materials. All of this activity processes and creates a space between myself and the world around me. What are some recent, upcoming or current projects you are working on? This past summer, I had a show at Almine Rech Gallery’s space on the Upper East Side, my first in New York. I was also honored to exhibit with many of my favorite artists – the French artists associated with Support/Surface – in an exhibition in Nice, “The Surface of the East Coast”, curated by Marie Maertens. If you had to explain your work to a stranger, what would you say? Come and see. What was the last exhibition you saw that stuck out to you? Marsden Hartley at The Met. What is one of the bigger challenges you and/or other artists are struggling with these days and how do you see it developing? To have the grit to address the current horror of our society without resorting to political platitudes – and then to have the courage to display this world’s joy. To embrace nuance over hyperbole. 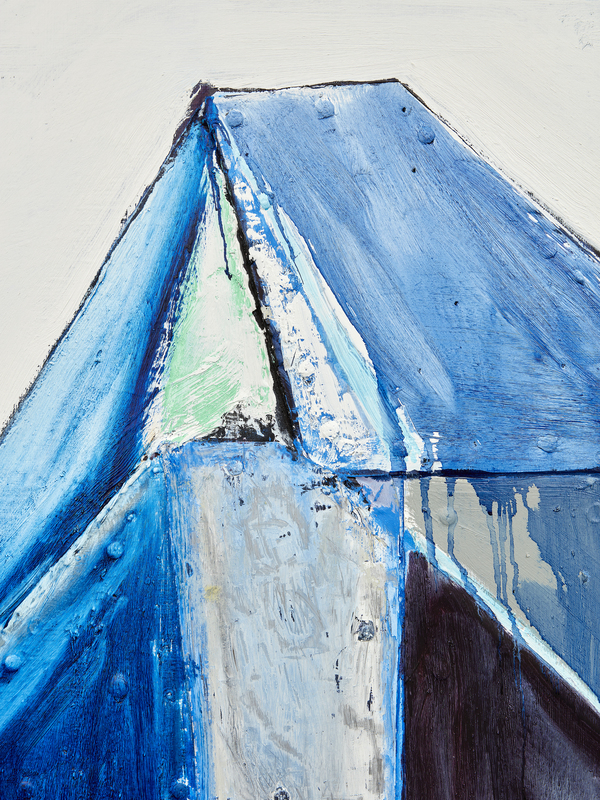 Delta (Detail), 2017 Found surface (sheet metal) and oil on linen over panel 78 x 46 inches – Courtesy the Artists and Almine Rech Gallery. What do you collect? Can I answer another question? “What would I want to collect if I had unlimited space and money?” I would collect Italian racing bicycles from the 1970’s. Describe your current studio or workspace. 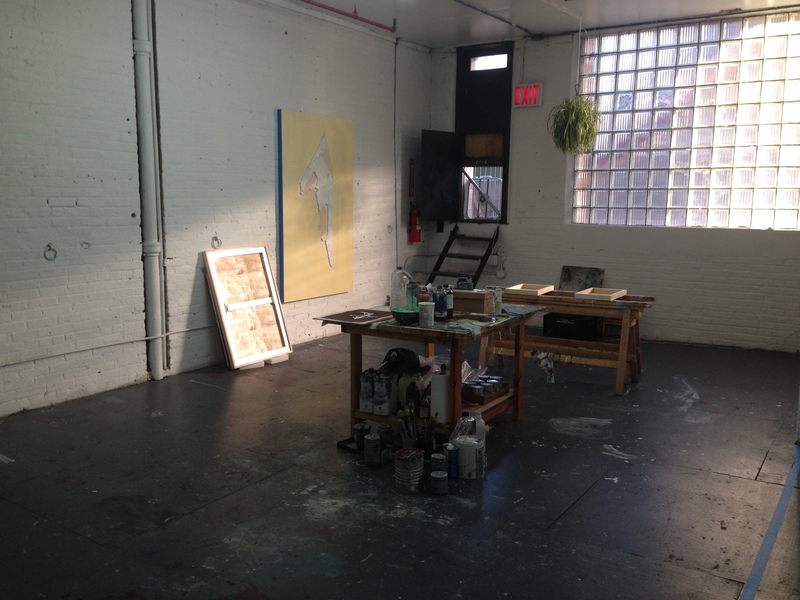 My studio is the second floor of an old firehouse in East Harlem. What do you do when you’re not working on your art? When I am not at my studio, I draw, read, walk, explore my spiritual practice. I cycle. While I don’t work at my studio on the weekends, none of these things are separate from my experience with art. 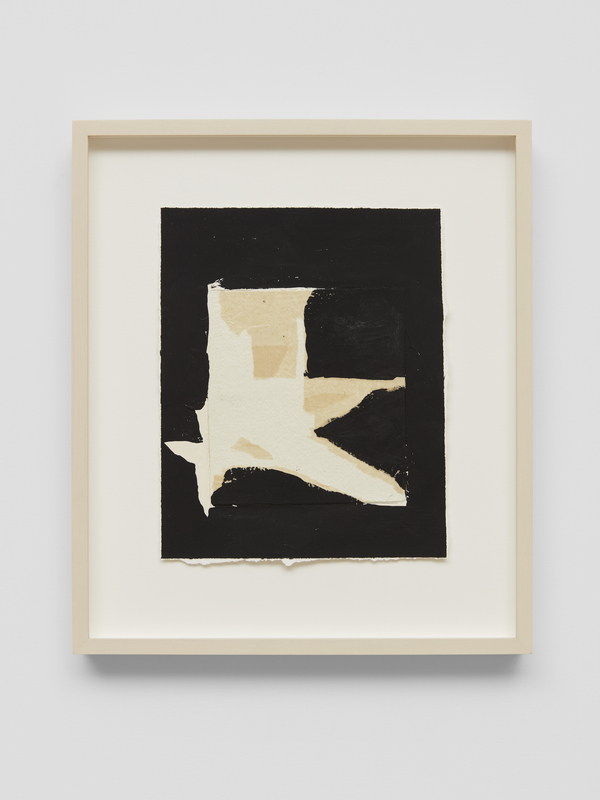 Untitled, 2014 – 2017 Flashe on Kozo (rice paper) on Arches watercolor paper 14 1/2 x 12 1/2 inches (framed) – Courtesy the Artists and Almine Rech Gallery. Can you share one of the best or worst reactions you have gotten as a result of your work? I have a British friend who expresses what he sees in my work in very literal terms – for example, “That is a boot!” or “These are paintings of primitive knives!”. I think it’s wonderful for the work to have such a straightforward correlative as a point of access for a broad public, but clearly, these images are not the full experience of the artwork, nor in my mind do they call to mind a very challenging work of art. So, I’d say my friend’s reactions are both the best and the worst at the same time. 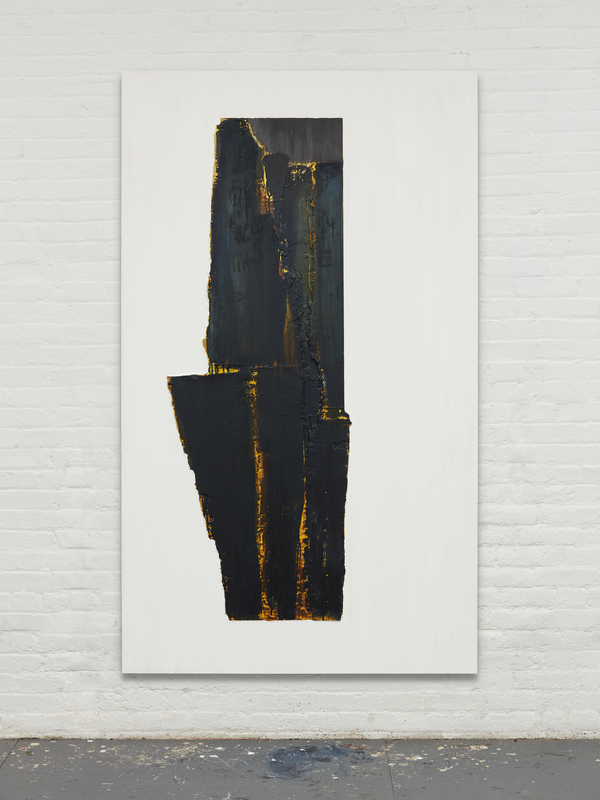 Untitled (Dark Wood), 2017 Found surfaces (luan), oil and acrylic dispersion on panel 78 x 46 inches – Courtesy the Artists and Almine Rech Gallery.